My stranding theory indicates that beached whales and dolphins swim blindly into the shore because they are suffered a previous barotrauma-style injury that damaged their cranial air spaces and knocked out the sense of direction. Rarely is there a particular stranding that illustrates this any more than the one that occurred last night in Otago, New Zealand. Attempts to stop a 4m-long pilot whale from beaching itself at Kaka Point, Otago, New Zealand failed. The whale was eventually left to die on the rocks. This whale was suffering for a severe pressure-related injury (barotrauma) that damaged its cranial air spaces and caused this animal to lose all sense of direction. This whale resides in a pod... where are the other pilot whales? Residents, police, firefighters and the Kaka Point Surf Life Saving Club spent more than two hours trying to help the injured whale back out to sea, but in the end the whale's desire to beach itself was too strong. Kaka Point resident Renee Butler first saw the whale swimming around in circles, apparently distressed, about 6.30pm. When it became caught on the rocks her partner and his son helped it back into the water. 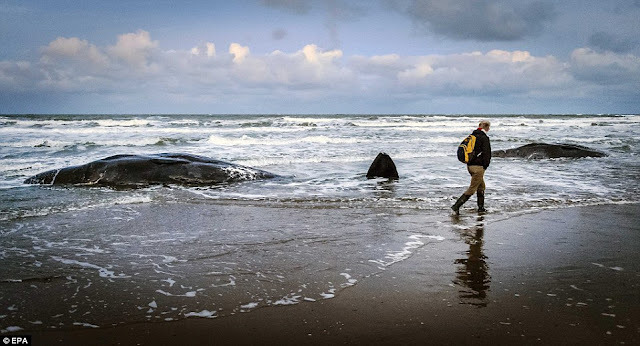 The whale, which had wounds on its tail and head, started swimming out to sea, but turned and started coming back in, so the men stopped it again. Ms Butler said the whale kept trying to come back in, so they stood around it, stopping it from beaching itself. An inflatable rescue boat from the Kaka Point Surf Lifesaving Club was eventually used to try to pull the whale to deeper water, but it returned. Mr Bennett said a decision was made to abandon rescue attempts about 9pm. DoC staff would visit the whale early this morning with a scientist from Massey University, who would fly from the North Island to study the whale. Stop cutting up whales looking for the answer to why they beach. Instead study the flow of the surface currents, the wind, and the tide during each beaching. Do this for the next 100 strandings. If the flow of the surface current is always towards the shore while the whales are in the process of stranding, you will know that the whales have no sense of direction. This is so because lost whales always swim downstream in the path of least drag. You will then know that LOST whales often swim blindly into the beach. Once you know the truth, then you can start cutting them up again to find out why they have lost their sense of direction. I would suggest you look for a barotrauma-type injury somewhere near their cranial air spaces because the air in these air pockets serves underwater as acoustic mirrors, reflecting, channelling, and isolating is such a fashion to enable biosonar. In other words, whales suffering a barotraumatic injury lose their sense of direction. Oil giant Shell will cover the cost of a necropsy (animal autopsy). Shell New Zealand is undertaking a seismic survey off the Otago coast. Operators are required to submit a marine mammal impact assessment to Doc as part of the pre-survey planning for a seismic survey. It is highly doubtful that a necropsy will uncover barotrauma from the seismic survey since the oil industry contributes a large percentage of the money spent to study whales. If Stu Hunter finds barotrauma, Shell will blacklist both Massey University and Stu Hunter. It will never happen... the whale will be found to be suffering from a viral or bacterial infection in the brain. Submitted by diamantina on Mon, 24/02/2014 - 12:00am. That's precisely the point. None of us know the whole story. Farewell Spit is a known whale stranding site, nonetheless, it is an unassailable fact that seismic surveys were conducted in January 5-18 (according to the website Rigzone), apparently some 90 km away. We don't know what caused the strandings, but the effects of oil and gas seismic surveys and drilling on whales should be studied before proceeding with more tests that could lead to additional strandings. These particular strandings could have been caused by any combination of factors, but seismic surveys have been linked to cetacean strandings around the world. With respect to drilling near Sakhalin Island, Russia, National Geographic reports, "Whale experts teamed up with the oil and gas industry to develop a step-by-step guide for reducing the impacts of noise pollution from marine seismic surveys on whales and other marine species." [Than, Ker. "Study: Planning Can Protect Whales in Seismic Surveys." National Geographic, January 14, 2014]. Has this been done here? Shouldn't this have been done here? I quote from a media release from Climate Justice Taranaki: “Spring-summer is the main period when many historic strandings of pilot whales have occurred at Farewell Spit, in part due to migratory behaviour. Why then was seismic surveying allowed to take place at this critical period, in such close proximity?” This is valid question. Perhaps if a planning study between whale experts and the oil and gas industry had been done here, as it was done for Sakhalin Island, these strandings could have been prevented. Submitted by sv3nn0 on Sun, 23/02/2014 - 6:36pm. Actually, Farewell Spit catches whales at the same time every year so you can't blame oil, especially as the whales weren't tested. It's believed to have more to do with the shallow, silty sea floor and the country's fastest and largest tidal fluctuations. Leaving out important information such as this does a lot of damage to worthy environmental causes. Submitted by diamantina on Sun, 23/02/2014 - 12:18pm. Good. Shell SHOULD pay. It's been well documented that oil and gas exploration and drilling can disorient whales and lead to strandings. But is it possible that the body of the pilot whale that died on Kaka Point is too decomposed to reveal the definitive cause for its stranding? I think it is too much of a coincidence that this occurred so soon after nine orcas tragically died on a Southland beach. Not to mention the 110 pilot whales that stranded on Farewell Spit, only 90 km from where Polarcus Alima was conducting seismic testing from January 5 through 18. During seismic surveys for oil and gas exploration, high intensity, low frequency sounds (from air guns towed behind boats) are directed through the seabed. The higher frequency sounds overlap with those used by toothed whales and dolphins, whereas low frequencies overlap with those used by baleen whales. Underwater noise during the oil rig or platform construction phase, such as noise from pile-driving and pipe-laying, can create extremely loud noise levels high enough to impair hearing systems of marine mammals near the source, and disrupt their behaviour at considerable distance from the site. Explosives used to remove the seabed can also harm whales. New Zealand is supposed to be a nation that protects whales, yet the govt. allowed oil and gas exploration to proceed without considering the negative consequences.